Allen provided a mix of systems, including the 10 watt, compact iCON non-contact laser coder and the 30 watt, high speed S3030PLUS SHS laser. 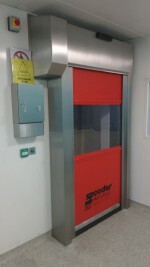 The Speedor pictured, manufactured and installed by HART DOOR SYSTEMS, has been fitted in a pharmaceuticals production facility in Cambridge. Mark Richardson, sales manager, says the door was installed in a wash-down area for parts of the plant used in the manufacturing process. A logistics company instructed a national refrigeration contractor to supply and install a new refrigeration plant totalling 1500KW for a new site in the South West.